As a high-productivity laminating system providing innovative versatile solutions, Digimaster that is the core point of the Silver Halide Replacement technology can be off-line lamination to the most of the digital printers. This above keeps the heating temperature while lamination and makes high thermal efficiency. This makes perfect lamination. As you may know, if the heating temperature is fluctuated by films, the glue on the films couldn't be melt down enough and this could be a cause of trouble of quality on laminated results. This roller system keeps temperature in good and uniformized state for the next finishing process. 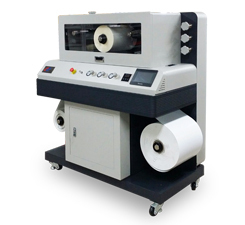 The laminator has Embossing Roller with Induction Heating System, then this satisfies the customer's needs with photo quality effect and increases the product level higher. The laminator has "Sleeking (Fusing) and Micronex system. "Sleeking" is the GMP' newly developed finishing solution to increase products value higher with various effects of "gloss, matt, hologram & metalic" easily by GMP Advanced finishing technologies.